Say what you will about trying to emulate famous people, but really, we'd all like to be a little bit more like our favorite celebrities. Perhaps mimicking their chosen style of bathroom decor isn't the first attribute that jumps to mind when it comes to living more like a favorite actor or musician, but it certainly doesn't seem like a bad place to start. What they certainly wouldn't have in mind is the bathroom George Clooney used during a humanitarian outreach trip to Chad. 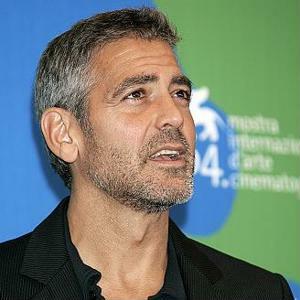 In an interview with MSNBC Dateline, Clooney pointed to a shabby toilet, which could only flush if a bucket of water was poured into the tank. In addition, the shower consisted of a nearby hose. Needless to say, these were not the luxurious accommodations the Ocean's Eleven star has grown accustomed to. So, maybe Clooney's not the best famous person to look toward when seeking good bathroom decor advice. However, Elle Decor has provided an insiders perspective into more glamorous celebrity bathrooms - including the cast concrete bathtub and stone styles placed in the bathroom of Transformers director Michael Bay's mansion in Miami. Meanwhile, Meg Ryan of Sleepless in Seattle fame has shown an affinity for antique bathroom furniture, while Friends star Courtney Cox has arranged a white oak bathtub, custom pendant lights, and an upholstered velvet chair and ottoman, according to the magazine. Some celebrity bathrooms don't exactly appear as fancy as one might expect. For example, Elle's picture of the bathroom at Matthew Broderick and Sarah Jessica Parker's Hampton estate relies on a consistent but simple theme of blue shower curtains, cupboards and floor tiles. A pair of sinks are separated by the cupboards, making the feel of the room a bit retro. Possibly because, as a touring musician, he's used to hotel bathrooms, John Mayer's master bathroom does resemble the provisional yet classy element of a high-end hotel bathroom, with Carrara-marble tub tiles and Armani/Casa towels. Million Dollar Baby heroine Hilary Swank, on the other hand, had million dollar ideas for the ambiance of her bathroom, which Elle reports includes travertine walls and floors, plus a walk-in shower that doubles as a wall-sized mirror.